Joey & Kalvin - Graphic Design Study in Japan: Typhoons, Chiba and Purikura! It`s been a pretty up and down few days. Friday was really good. We met Jiro Plutschow, a professor in the media department. He showed us around the media centre and gave us lots of information about the graphics courses here. It was a releif because up until meeting him we`d had no info about graphics. We also had our first japanese lessons on Friday which i think went really well. They`ve put us in the lowest level class. Its great because thats pretty much my level. The course runs at a very quick-pace though and one day dreaming session will leave you missing chunks of very important Japanese. Friday night staged the event people had been talking about all week; the typhoon!!! We were warned numerous times about the typhoon, and I even had to cancel plans to visit friends in Yokohama because of it. The reality for me though was the typhoon hitting around the time I fell asleep and finishing around the time I woke up. 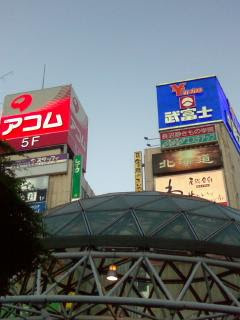 On Saturday I visited Chiba! Actually my main reason was to find an international bank. I only had enough money in my wallet for the train fare there an back. When I arrived in Chiba I immediatly found myself in the banking district but couldnt find an international bank. I plucked up the courage to ask a local who was extremely helpful. He walked me about 10 minutes up the road trying to find an international bank, so thank you to him..... whatever his name is...... Actually he couldnt find one, but I asked some Americans and they told me where it was..... Oh well. Finally I want to talk about my adventure to a Purikura booth in Tokyo. Purikura is an insanely over the top, hyper, colourful photo booth. They`re full of groups of high-school girls and loud techno pop plays throughout. The booths are big and usually pink and encourage you to jump around and dance to techno music whilst having your picture taken. I went with 3 of my friends; Hisako, Koyuki and Aki. Me and Aki felt pretty self-conscious as we were pretty much the only boys in the building. After having your picture taken you are asked to draw on them digitally with a selection of flourescent coloured paintbrushes and symbols! It was a good larf! Check the picture out (Top of this post).